Most of the person who love to use these costly electronic gadgets but the don’t able to take proper care of these electronic gadgets due to the lack of knowledge how to keep safe of these electronic gadgets. Due to that reason we are facing lot of problem and defect generate in these gadgets so, today we discuss how to properly take care your android smartphone and these electronic gadgets. 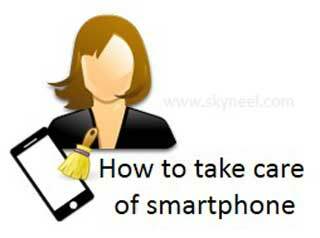 There are few important steps which you have to take to properly take care your android smartphone. These few small tips gives you battery stratification and keep safe your smartphone for long time. Most of the time you will see that lot of dust you found at the rear camera lens. And if you want to take any picture or want to do any recording that will not shown clearly, because lot of dust generate problem for clear vision on your photo or recording. So always keep in mind that you have to clean your mobile camera lens with a soft cotton, then you will take any picture which gives you better clarity. You can also use different features like auto focus and other to take better picture quality. Most of the person always keep on his smartphone Bluetooth option, which consume lot of battery of your phone and then we complain to company regarding battery problem. So, always remember when you don’t need of Bluetooth then immediately turn off this option in your phone otherwise you will face battery problem. It is one more important thing which you don’t known. Lot of person use his smartphone directly in sunlight to take pictures. These electronic gadgets will be used in normal temperature otherwise these gadgets are infected with some defects. Always remember that lot of heat or cold generate any kind of defect in your smartphone so, keep these devices in normal temperature. Most of the person use other phone or local charger to charge his smartphone battery. If you use any local or other charger then your phone battery is not properly charge. So, always use your phone original charge to charge your smartphone battery and also remember one thing don’t charge your phone on full night, otherwise your phone battery will be damage. Lot of person charge his phone battery when they talk to other. Please don’t use your phone until your phone battery is not charge properly. When you are using your phone this problem is faced by mostly android users. Your phone show an alert message to update any installed program on your smartphone, and if you tap on update button then your phone will be slow. So, always ignore this kind of alter update on your smartphone otherwise you will be disturbed. Most of the person don’t set any kind of password on his smartphone. Due to that reason most of the time your important or confidential data will be seen or hacked by the other persons. Anyone can steel your important pictures, phone numbers from your smartphone, but if you want to keep safe of your data then always keep protection of your smartphone by setting finger print lock system or face lock system. I hope you like this article, these are few small things which we ignore lot of time due to that reason we are facing lot of problem. So, always keep in mind these few important thing which not only keep safe of your smartphone but also provide battery features to you. Thanks to all.